Rookie point guard Brandon Knight, of the Detroit Pistons, has suffered a broken nose while going for a rebound in the first quarter. 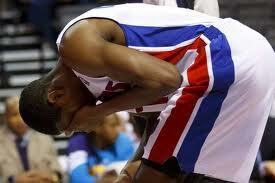 Pistons centre Greg Monroe inadvertently hit Knight with his elbow while going for the same rebound. The Pistons have released a statement saying he will be out indefinitely, which is a bad sign for the struggling Detroit franchise. Knight was coming off a career high 26 points in a win over the Milwaukee Bucks. :) you are doing really well, i'n enjoying your work and looking forward to more posts.